When it comes to driving traffic to your blog, Twitter is a force to be reckoned with. Even relatively modest Twitter accounts can produce a healthy level of traffic. Take the personal blog of one of our team members here as an example. The above is a screen shot of the top two referring domains from the past seven days. As you can see, Twitter referred the second most amount of visitors to the site. And above we can see the total number of visitors from all sources for that same time period. As you can see, there were a total of 1,420 visits. Based upon the above figures, Twitter accounted for over 8% of traffic to the blog. And that is from a Twitter account with not even 1,000 followers. This recent article over at awe.sm claims that Twitter drives four times as much traffic as typical analytics data suggests. Such a claim should be taken with a pinch of salt, but it is certainly valid to a degree. Traffic referred by Twitter is not always properly accounted for, with visits from desktop software and indirect referrals via other social networks being two good examples. It has in fact been demonstrated that Twitter can account for well over 20% of your total visits. Take this post by Steve Scott as an example – he was able to drive over 5,000 visitors from Twitter in the month of January. There can be little doubting Twitter’s power in driving traffic to your blog. Now let’s get down to the nitty gritty. Yesterday, we gave an overview of the methods you can employ to gain more followers and visitors. Today, we are going to go over a select list of tested and approved plugins that allow you to better integrate your Twitter account with your blog, and automate certain tasks. So without further ado, let’s go through the plugins. If you followed our advice with regards to publishing your posts at the optimum time, you will be scheduling your posts, rather than simply publishing them when they are finished. As such, you may not always be at your computer to share your posts when the time comes. 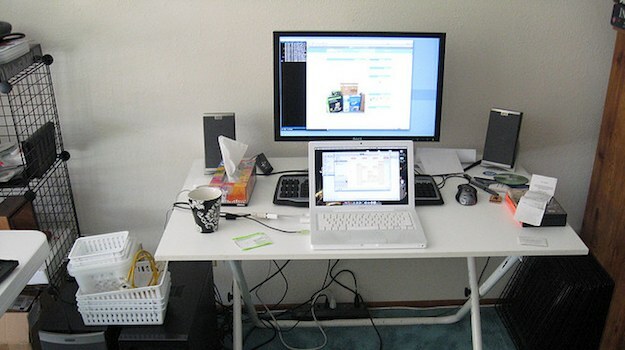 That’s right – some people actually leave their computers for short periods of time. Fortunately, that doesn’t have to be a problem. 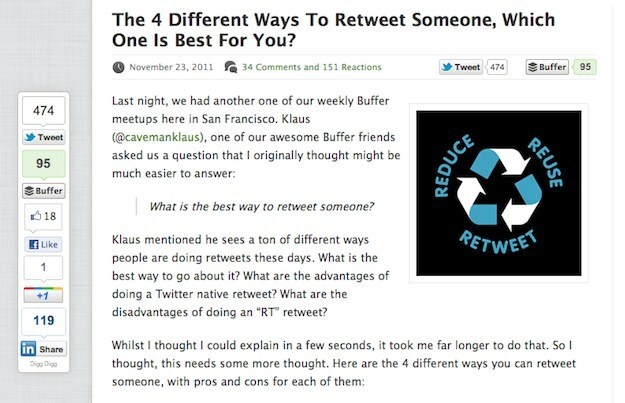 Just install WP to Twitter on your blog, and it will tweet out your new posts for you as soon as they are published. This plugin is similar to WP to Twitter, apart from it will periodically tweet out links to your archived posts, as opposed to new ones. It has various settings – most importantly, you have the ability to set how often tweets are sent, and you can also exclude categories or individual posts. Once you have started to collect a few followers, you are likely to get far more traffic from people tweeting your content, than you doing it yourself. And that is where WP Tweet Button comes in. WP Tweet Button in action. 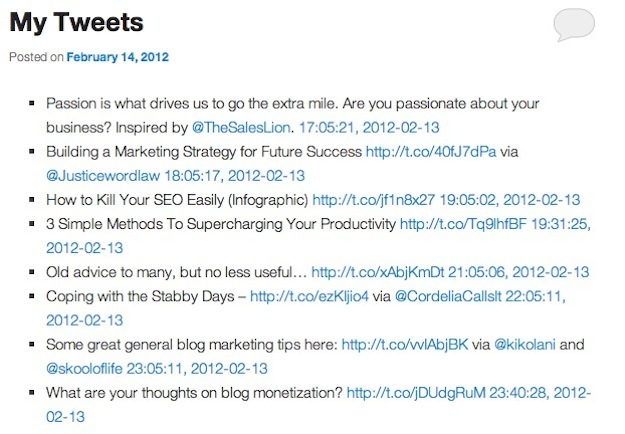 As you can see from the above screenshot, the plugin places a tweet box in your blog posts. If people like your content, this gives them an easy opportunity to tweet it. If you are keen on social sharing but don’t want to just limit yourself to Twitter, Digg Digg is your best option. As you can see from the above screenshot, Digg Digg places a floating share bar to the side of your blog’s content. It can also place share buttons within your post’s content, and much more. There are a multitude of customization options, and you can do a great deal in terms of customizing what is seen. You can set the post to publish automatically, or be saved as a draft, so that you can edit it before publishing. 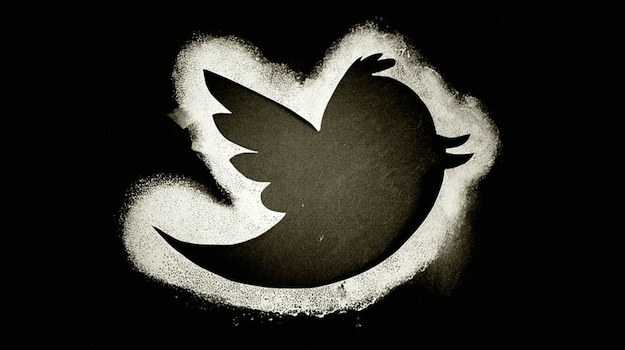 So we have listed what we think are the 5 most useful Twitter plugins for WordPress. But have we missed any that you think are worthy of being on this list? Let us know in the comments section! We utilise SNAP Autoposter – It allows us to post to Twitter, Facebook – basically any one we want. Obviously not all people have the skills to create their own theme. If you do use a plugin make sure it does not have a massive effect on site speed. It’s more important than you think! You make a fair point Sebastian, and it’s certainly not something we ignore (see this and this). Having said that, Digg Digg (which is the plugin I would most recommend) is a lazy loader, so doesn’t slow down any other elements on your site.